One trade-in we made when deciding to downsize to a smaller home was losing a full laundry room. 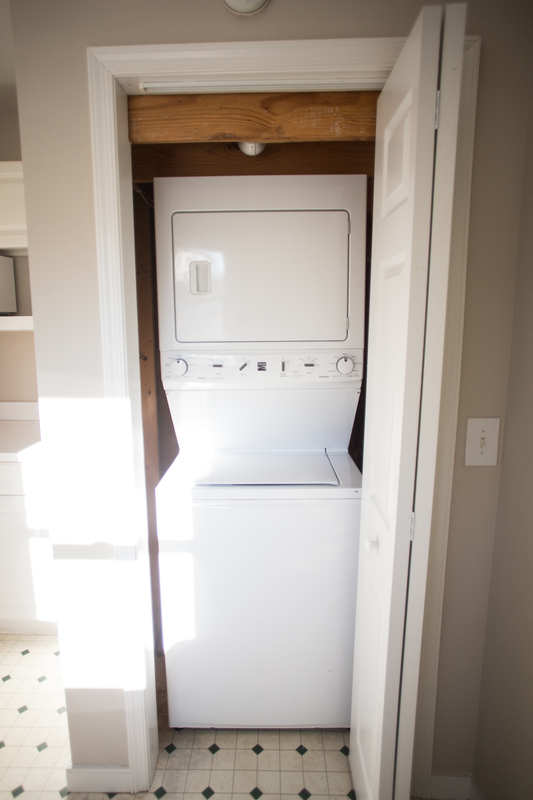 In our Richmond Fixer Upper, the laundry area is a small, 25 sq ft closet beneath the stairs in the kitchen. I was grateful it was inside the house, rather than in a shed or basement area, and I also knew it would take some creativity and work to transform it into a functional and beautiful laundry space. 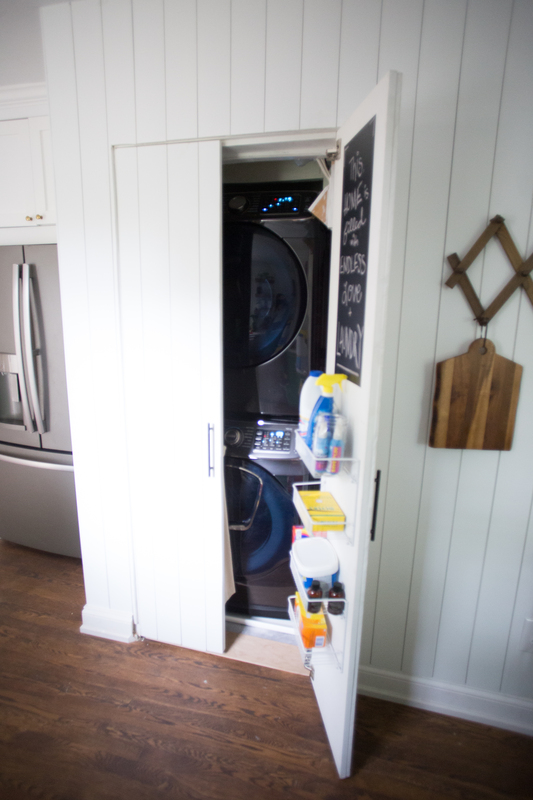 Here is a peek at my renovation process, and some tips for how to maximize space in a small laundry closet in partnership with The Home Depot. I also shared a full video on YouTube about this space! The first step to renovating and redesigning the laundry area is to clean up what is already there. Our closet had been neglected, and it appeared to have always been an afterthought. The shelving had been roughly built, nothing was painted, and the flooring was the same old linoleum that had covered the kitchen floor. In addition, the space went back so deep beneath the stairway there were unreachable spots. Garbage, dust, and dead insects had collected in piles, and I had to face my disgust with a broom, mask, and gloves to even begin. Once I cleaned up the actual space, and made it free from dirt and garbage, it was time to clean it up visually, as well. I recognized the deep space beneath the stairs as inaccessible, so rather than trying to optimize it as storage, I built a new shelf and closed off the depth with a small wall. 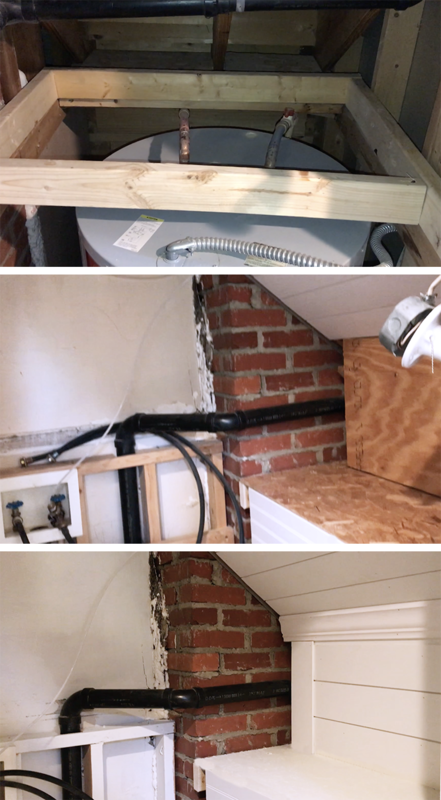 I covered the water heater with a removable panel, for visual organization. I painted the raw wood and shelving. I pulled up the old linoleum and installed inexpensive peel and stick vinyl flooring. It is incredible the difference it makes to simply give everything a fresh coat of paint and some clean, wipeable surfaces. Even before the new appliances were installed, the room felt so much more intentional and nice. Although the old stacked laundry unit in the house was functional, it was smaller than we hoped, and lacked some of the features we hoped for. 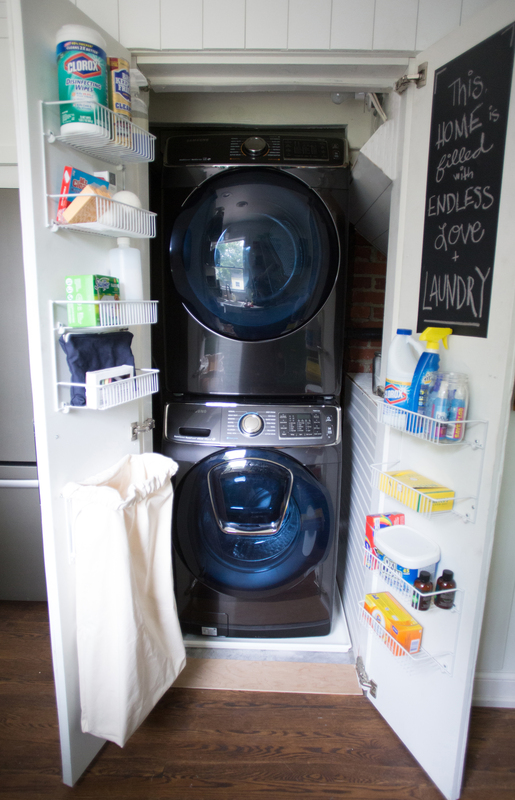 Since I was working with such a tiny space, I wanted to really maximize the functionality of the laundry closet with the best appliances I could find! I partnered with The Home Depot to chose these Samsung 5.0 cu. ft. High Efficiency Front Load Washer with Steam and AddWash Door in Black Stainless Steel, ENERGY STAR and the Samsung 7.5 cu. ft. Electric Dryer with Steam in Black Stainless Steel, ENERGY STAR. I have been using them for 2 months now and am completely obsessed! I wrote all about my very favorite features and a full review of the appliances over on The Home Depot blog, which I hope you will check out. They are really amazing and I am not kidding when I say I have loved doing the laundry! I normally had been skeptical of front loading machines, because of capacity, cleaning power, and maintenance. (There is nothing worse than a stinky washing machine!) These machines rested all of my concerns. The capacity is huge, I am able to put two full baskets of laundry into the washer at once. The clothes come out as clean as with my nice, top-loading washer from our last house, and the washer has not had any mildew issues. Because of how we have them situated behind doors in the kitchen, I am able to leave the washer door ajar when it is not in use (which, isn’t actually very often…) and it has dried out nicely! The black stainless steel felt like a fun, chic choice for this tiny laundry closet, and I am wowed every time I open the doors. They are seriously the most beautiful machines, and I love the way the black doors match the black stainless and everything looks clean and nice. Huge fan, here, folks. If you are looking to upgrade your washer and dryer, I can whole heartedly recommend these. The final, very important tip for maximizing space in your small laundry closet is to use creative storage solutions. Any time you are working with a small space, you need to use new eyes to SEE space that isn’t obvious as storage. In our laundry closet, the space I saw was on the back of the doors. We had the old bifold door replaced with custom doors when we redid the cabinets in the kitchen, then we set them back into the wall so they disappear when closed. 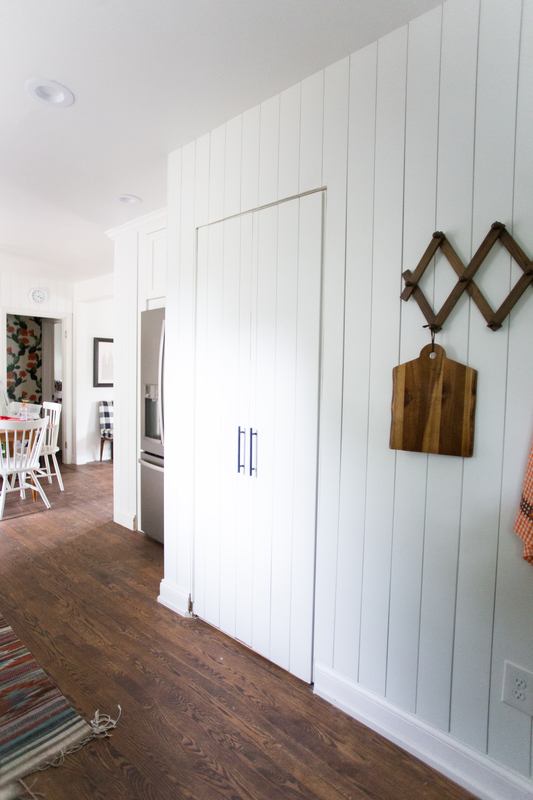 Adding vertical shiplap across them to match the wall paneling also was a fun way to hide them in the wall. When they are open, however, they are really hard working doors! The door jamb between the closed doors and the front of the machines is about 5″. When I was wandering through the closet storage solutions aisle in The Home Depot, I spotted these wire shelves. They screw directly into the wooden doors, and provide a space for the laundry detergents, dryer balls, stain removers, and everything I need to keep the clothes clean. I installed them on the top of one door and the bottom of the other, to leave room for the machine doors to open all the way. In addition to the door shelves, I created a small hanging laundry bag for my dirty kitchen towels. 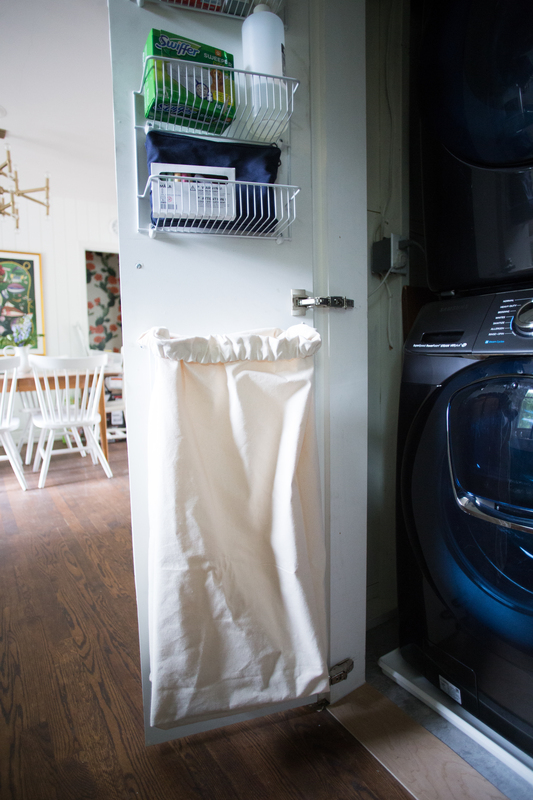 It is convenient to open the door and toss those dirty, wet kitchen towels into a laundry bin right in the laundry closet. The canvas bag and the towels can all be washed at once, which is super convenient. I have a tutorial for the laundry bag coming soon! I also added a sticky chalkboard vinyl to the top of the door for some fun design. I can use it practically for lists and ideas, or simply decoratively with quotes and fun drawings. It was a fun way to add some personality to the small space. 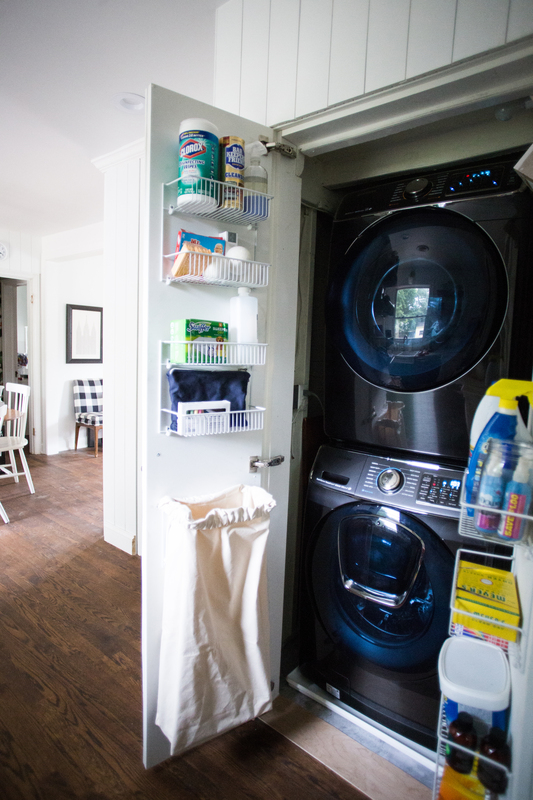 Can you believe the difference in this small laundry closet? I love a good before and after, and this space really just needed some cleaning, nice appliances, and creativity to transform it into the beautiful, super functional, and intentional space that it became. 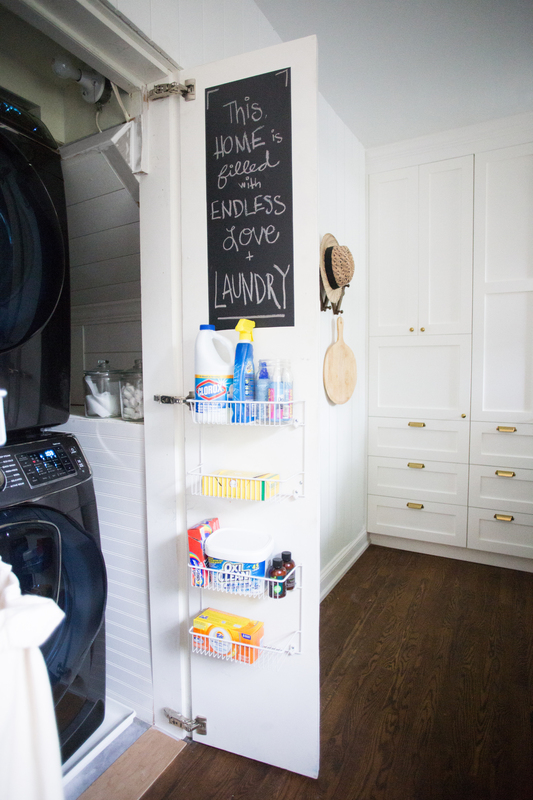 I hope these tips give you ideas for how to intentionally maximize the design, organization, and function of your laundry space, whatever size it may be!